The 16″ 6.5 Grendel, Type 2 M4 barrel is the perfect barrel to start your next build and add to your AM-15 collection. This barrel is made from 4150 Chrome Moly Vanadium Steel with a Parkerized finish. Featuring a carbine length gas system with a .750″ gas port and a 1:8 twist, this barrel provides top accuracy and precision for your 6.5 Grendel build. Decent barrel. Would have preferred a Grendel II chamber. Great Barrel for the price. 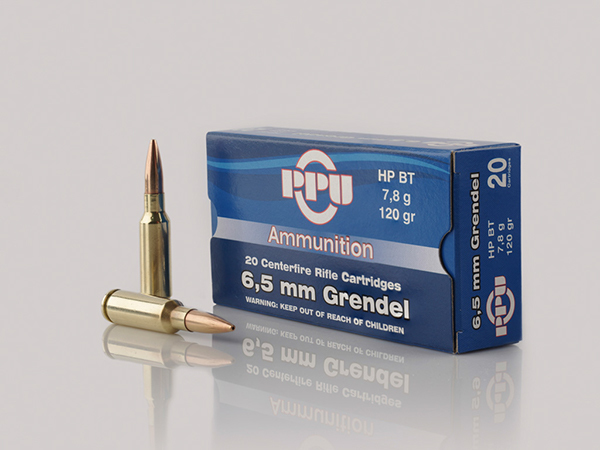 I usually use much more expensive Grendel Barrels and thought I would give one of these a shot. Built it up and off to the range. Sighted on 3rd round and on target. This will make a great Med Game Rifle at a very reasonable price. Ill order more as soon as they are back in stock. Impressive. I bought this barrel to build a lightweight rifle for hunting, I was previously using my 20″ heavy barrel 6.5 Grendel and it was too heavy and awkward to enjoy carrying through the woods. Much to my chagrin, this $100 barrel shoots exactly like my expensive competition barrel. I ran it through an abusive break in with no lube, and had no failures. (I bought the bolt carrier group from here also). When the barrel heated up after 24 rounds, there was less deviation than my fluted stainless steel heavy 20″. It groups wolf military special better than my other one, and shoots sub MOA with match. I highly recommend this barrel, I hope that you all keep making it, I might wear this one out…I would really like to see it in RF85. We are glad the product is working for you. please be on the lookout for this in RF85 in a few weeks. Any way to be notified when back in stock? Should be back in stock soon. When will this barrel be back in stock? Can you notify me when this barrel is back in stock? we are working on a order for uppers right now. Should be a few weeks. Not a review, just an observation….M4 cut and carbine gas are interesting choices for this round. Any possibility of a government profile with mid gas? any timeline on this item returning in stock? Is the current barrel RF85 treated? I ordered one less than a week ago. What magazine does it use? Are you sure this is type 1 Grendel? My bolt head (from Anderson and ordered in the same order) measures 0.136″ deep in the case head recess. Type 1 from everything I read is 0.125″ (same depth as a .223 bolt recess). I can chamber a round and it’s tight with your 0.136″ case head recess bolt which I believe means that this and your bolt are both Type 2 Grendel. Here’s where you’re getting confused: Grendel I and II have to do with different iterations of the chamber. There was a minor adjustment in the THROAT. However type 1 and type 2 bolts are a while different topic and hark back to the earliest adaptations of 7.62×39 to ARs. The less common .135 bolt face got called type 2. So in this barrel it is a Grendel 1 chamber which were required to use the. 135 (type 2) bolt under the trademark. Even now that the trademark has been released, .135 is the standard. Manufacturers would be pretty foolish deviate from that and not make it VERY clear. The safest solution is to buy bolt and barrel from the same manufacturer which it seems you have done. In the future sale, it is possible that u can offer the customer with a combo special barrel & bolt for 6.5 Grendel ? I’m gonna be the first on your list to order!!!!! Works great. Requires the Grendel Bolt .135 bolt face. Very Accurate. Great Finish. Extremely happy. I bought this 16 in barrel and Anderson bolt together. I wasn’t sure about type 1 or 2 with these. I’ve shot 123, 120, 85gr, and some wolf steel case with 100 gr bullets. All shot flawless. No jams in any. My other Grendel is a 20 inch type 2 and cost 3 times more. Have an Anderson lower waiting for this barrel. Any idea when they will be back in stock? Can you pre-order? We hope to have some later this week. I have one works great once broke in my chamber was a little tight using either type 1 or 2 bolt faces I polished the chamber a little feeds good now. People are getting confused on the type 1 and 2 chamber thing their bolt faces are actually a type 2 spec but the barrel chambers are type 1 which means you can use either type 1 (.125) “7.62×39) or 2 (.136) bolts. When will u receive more shipment? Do you have this 6.5 Grendel barrel in 18 or 20 inch? Any updates on your shipment of 6.5 Grendel barrel. Hi, do you know when this barrel will be back in stock? The 4th Put barrel in cart and by the time I put my credit card info it it was sold out! Today refreshed all day the 6th as you said would have some out this afternoon. Never did show as in stock. How about letting Us reg people buy some and put a limit on how many you can buy so the Re-sellers STOP buying them all so fast? Since you took my last post down, How about simple question! When will barrels be in stock where us Normal Buyers can get one? What is the barrel material? I been watching this myself for over 6 months it’s a shame it’s Always out of stock. Can I order a barrel and B C G and have it shipped when you get them in. Have never seen one in stock. the barrels should be shipping to us within a week. I would like to purchase this item, when will it be back in stock? Does this barrel accommodate a standard A2 front sight with taper pin grooves? I don’t know if u really want customer, I’ve been looking for this 6.5 Grendel barrel on ur website more than two months, still O U T O F S T O C K up to now, I know some people waiting for this item is more than I waited, come on Guys if u want business? Try to make that out of stock to in stock ready to purchase. When will you have more ? I ordered this bbl. A couple weeks ago along with b.c.g. was shipped same day, within hrs. of order, I got it next day, I live in state next door. Fit and finish is superb and headspace is good! Haven’t fired yet, so no accuracy results to report. This bbl. Wasn’t in stock when I decided to buy it either, but i checked on it frequently and it became available in a couple short weeks. Some folks shouldn’t blame others/anderson for their own lack of diligence, just saying! I find it odd I post a negative review to see it deleted. I purchased two of these barrels to go with Anderson’s associated BCG. Neither one would chamber factory rounds. On further review with a bore scope and a Grendel reamer which is in spec there is definite proof the reamer used to run some of these barrels was out of spec and have pictures to show it. Generally this is associated with a reamer being sharpened one too many times. I’m not sure who makes these barrels for Anderson ( I’m almost positive they do not make their own) but they are definitely an epic fail. Like many manufacturers in the industry quality control is going by the way side and it is an utter disappointment as I have had no issues with Anderson prior. Come on guys regardless of the fact that I have a grendel reamer I didn’t buy a drop in to have to fix it. what was the order number for the barrels and BCG? We would like to discuss further to see what the real issue is. Any updates on when barrels will be in?Been trying for several months to get one. Picked up the barrel about a month or 2 ago. I ordered a .136 bolt that I installed on a FA rated BCG and I have had zero issues. 6.5Grendel is .136 bolt I wish they would stop this type I or II junk. They should say SAAMI chamber instead that’s less confusing. If you use .125 it’s on a 7.62×39 or 264 LBC Thanks for the deal on the barrel Anderson mine runs lacquered steel and brass just fine. U keep posting that 6.5 Grendel ( Barrel)will be back within two weeks, come on Guys I think U keep posting that since last year? The way I think it’s gonna be the same for this year if somebody will ask for that 6.5 Grendel barrel, same words, be back within two weeks!!!!!!! The barrels are in stock right now. They just can’t keep these in stock. If anyone is trying to get one, check back often, I was checking every other day, until they came in stock, then ordered because they will be gone that day. Thanks for having these in stock more more regularly lately. Like alot of people i have been disheartened at the unobtainium status for a long time! …”they do exist!” Can’t wait to buy one… Thanks again! Placed my order for this barrel, what size gas block does it take? I’m assuming it’s .750″? What’s the gas block dia? When will these come back in stock? Great looking barrel out of the box. It is roll marked “1/8 6.5 Grendel” (I add that since it was circulating on some website that the barrel had no markings on it). Rifling looks great. My questions are, 1) it says that it is Grendel 1 chamber…is this the SAAMI spec chamber, or another chambering for the Grendel? And 2) what is the barrel steel? Some Anderson barrels are listed as 4150 or 4140, but this particular barrel is not designated as either. Can we get an accurate picture, please?! My only issues so far with Anderson Mfg. is mostly because of the lack of good pictures for your parts, and consistent information in the descriptions across all the part types. Will there be a 18in or above grendel barrel ever offered. Would order it today if it was. Great barrel! Fantastic job and like others have said check often & be ready to order as they restock. Great job, guys! Just got back from range. My grendel build is sub moa at 50 and 100 yds using a vortex strike eagle scope and Hornady a max 123gr. Chambered rounds perfectly, no malfunctions. Anderson parts are awesome. One thing I noted was when I chambered a round and then removed it unfired, there was a small dimple on primer. Is that normal? When will these be back in stock, I want this but might have to go with the 6.8 if they aren’t coming back in stock soon. Just finished my build. Watched every day to see when barrel was in stock and jumped on it when it was. Does not seem right that a rating would be based on whether or not the product is in stock. Looking forward to my first test-fire later this week! Thanks for an affordable barrel Anderson! Will these be in stock soon? Any idea when more of these will be back in stock? Will your Low profile gas block SKU: AM-56-LP-GB.750 AND your hand guard SKU: AM-66-A2-CAR work for this barrel? Is there any way to be notified when these are back in stock? When will these be back in stock, been looking for a couple months now with no luck. Do love your products have built several rifles with your parts. Probably on of the better 6.5 Grendel Barrels I have used. Extremely impressed with its durability and accuracy. loves the 100gr noslers I throw through it. I often place top 5 in local precision matches using this 16″ barrel. Would like to see what y’all can do with the 6.5grendel in a 18″ or 20″ barrel. Any future plans with this caliber? How long until the RF85 are back in stock? I love this barrel. I used an Anderson upper and lower along with it and my friends with their 24″ $450 barrels stay ticked off at me when I routinely outshoot them. Really, 40 rounds through a one inch hole at 200 yards. I live to see their tears. Really does a fine job filling the freezer at deer season too. 3 does ranging from 85 to 190 yards. None went farther than 40 yards. when do you update your barrel stock? Will your RF 85 grendel be in stock today. If not do you have a ET.